The Distinguished Lecture Series began in 2001 and is a yearly event organized by Anthropology Graduate Student Association with the support of many other departments and organizations. AGSA invites leading scholars in Anthropology to the University of Kentucky to foster the mutual exchange of ideas among the speaker, anthropology students and faculty, students and faculty in other departments, and the broader public. Contemporary trends in mass media communication indicate serious public confusion about the nature of science and the status of evidential reasoning. Archaeologists, in an effort to make esoteric research programs interesting to the public, have contributed to this problem by providing over-simplified stories and “lessons from the past” that overinterpret evidence and mystify analysis. We have allowed public intellectuals from other disciplines to speak for us, and we have failed to address the dangerous gap between what we say about the past from what the public learns about the past. One result has been that news stories about archaeology inadvertently promote political values that neither archaeological data nor archaeologists support. Archaeology is not alone among the sciences in its attempt to enchant the public with fashionable explanations and easy answers, so the problems and the potential remedies for archaeology’s missteps with publicity are related and similar to those of other disciplines. In this presentation I consider how archaeologists and other scientists might recast our public interactions to encourage a more well-informed citizenry. I argue for a more respectful engagement with the public and insist that scholars must take more responsibility for our media exposure. Dr. Agustín Fuentes, The Rev. Edmund P. Joyce, C.S.C., Endowed Chair in Anthropology, University of Notre Dame. 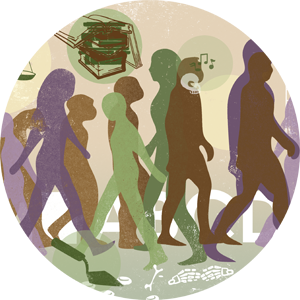 The Creative Species: Imagination and Collaboration in Human Evolution. February 2, 2018. Dr. Rayna Rapp, Associate Chair of the Anthropology Department, New York University. Banking on DNA: Thinking about New Genetic Tests in Comparative Contexts. October 21, 2016. Dr. T. R. Kidder, Edward S. and Tedi Macias Professor and Chairman of the Department of Anthropology, Washington University in St. Louis. Ancient Lessons for Modern Times: An Environmental History of the Yellow River, China, 5000-2000 BP. March 10, 2016. Dr. Theodore Bestor, Reischauer Institute Professor of Social Anthropology and Japanese Studies, Harvard University. Reflections on March 11, 2011: Japan's Disasters and Their Aftermath. March 13, 2014. Dr. Alison Wylie, Professor of Philosophy and Anthropology, University of Washington. A Plurality of Pluralisms. February 17, 2012. Dr. Leo Chavez, Professor of Anthropology, University of California, Irvine. Immigration Reform and the Latino Threat. March 25, 2011. Dr. James Ferguson, Susan S. and William H. Hindle Professor in the School of Humanities and Sciences, Professor and Chair of the Department of Anthropology, Stanford University. Anthropology and the Crisis: Reflections on Distribution and Labor. March 29, 2009. Dr. William Longacre, Riecker Distinguished Professor Emeritus, University of Arizona. The Role of the American Beaver in the Development of Anthropological Archaeology. March 6, 2009. Dr. Lee Baker, Associate Professor of Anthropology, Duke University. Pull 'em up Son — The Racial Politics of Pants and the History of Anthropology. February 29, 2008. Dr. Faye Harrison, Professor of Anthropology and African American Studies, University of Florida. Remapping Race, Gendered Agency, and Globalization along the U.S. Southern Transborder. March 23, 2007. Dr. Bruce D. Smith, Curator and Director of Archaeobiology Program, Department of Anthropology, National Museum of Natural History, Smithsonian Institution. Ancient DNA and the Early History of Bottle Gourds (and Humans) in the Americas. March 3, 2006. Dr. Melinda A. Zeder, Curator, Archaeobiology Program, Department of Anthropology, National Museum of Natural History, Smithsonian Institution. Agriculture Sciences and the Origins of Agriculture. March 2, 2006. Dr. Erve Chambers, Professor of Anthropology, University of Maryland. Anthropology as an Invention: Who Defines Us, What are Our Options and Why are We Being So Timid? March 25, 2005. Dr. Patty Jo Watson, Edward Mallinckrodt Distinguished University Professor of Anthropology, Washington University in St. Louis. Cave Archaeology in North America. March 5, 2004. Dr. Thomas Leatherman, Professor of Anthropology, University of South Carolina. The Space of Vulnerability: A Political Ecology of Health in Latin America. February 28, 2003. Dr. Carole Crumley, Professor of Anthropology, University of North Carolina, Chapel Hill. From Garden to Globe: Linking Time and Space with Meaning and Memory. February 8, 2002. Dr. Richard B. Lee, Professor Emeritus of Anthropology, University of Toronto. Foragers to First People: Transformations among the Kalahari Ju/'hoansi. March 30, 2001.